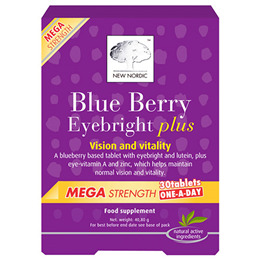 These original Swedish Blue Berry tablets are recommended to people, who want help to maintain healthy eyes and vitality. 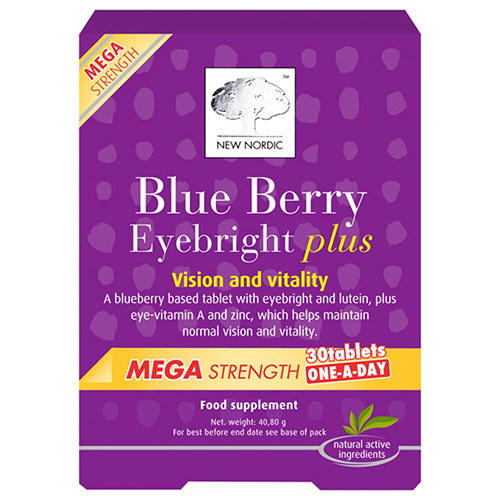 The tablets contain blueberry, tagetes flower standardised to contain 10 mg lutein, eyebright, vitamin A, zinc and copper. Lutein is a carotenoid naturally found in the macula of the eye - the part of the eye responsible for central vision. Vitamin A (eye-vitamin) and zinc plays a vital role for maintenance of healthy vision and are essential nutrients for maintaining vitality. Blueberry extract (Vaccinium myrtillus L.), filling agent (microcrystalline cellulose), eyebright extract (Euphracia officinalis L.), disintegrator (crosslinked sodiumcarboxymethyl cellulose), coating agent (vegetable magnesium salts of fatty acids, hydroxypropylmethyl cellulose), minerals (zincoxide, coppersulphate), anti-caking agent (silicondioxide), vitamine (retinylactate). Do not use if blister package (inner foil) is broken or tampered with. Below are reviews of New Nordic Blue Berry Mega Strength One-A-Day by bodykind customers. If you have tried this product we'd love to hear what you think so please leave a review.